Now that Easter and Spring Break are over, we’re definitely preparing for summer around here! As I mentioned in my last post, we have a few activities planned to invite the kids back into the church for some learning, fellowship and fun over break. I’ll have more details on those events very soon (cooking, gardening, art and just recently added, music). The dates are as follows: Gardening: Sunday, May 22nd in between services (9:30-10:30). Cooking: Sunday, June 5th (Time TBA), Kool-Aid and Canvas (Time, Date TBA), Music (will be in between Sunday services, Date TBA). Sunday school this Sunday will take place in the garden. Don’t forget to send your kiddos in clothes that are OK to get dirty! On March 20th the younger Sunday school kids covered Holy Week, Luke 19: 28-40, 22:14-23:56. The older kids discussed Matthew 27:27-56 and how through death, Jesus shows us the way to eternal life. 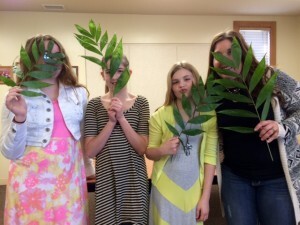 A Little Fun on Palm Sunday! Ready, set, go! On Easter Sunday the kids enjoyed breakfast and an Easter egg hunt between services! Registration is now open for St. Paul’s first Parents’ Night Out on Saturday, May 14th from 5-8 p.m. Take some time to yourself and bring the kids to church! Courtney, Nate and our youth volunteers will have dinner, snacks, games and various faith-based activities to keep the kids busy! The cost is $5 per child with proceeds to benefit our children/youth programming. If your child attends Nate’s youth group on Wednesdays, they have volunteered to help with this event–therefore there is no charge for them (please let me know if your youth student cannot make it). Nursery volunteers are needed for this event, please let me know if you’re interested in helping. Click here to register your children for this fun event. God Squad resumed this week. The kids enjoyed Casey’s pizza and the younger students discussed The Road to Emmaus, Luke: 24:13-35. 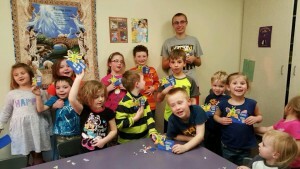 Tom’s students finished up their lesson on Easter and John 20:1-18. It was great having everyone back! Wednesday nights sure are lively, which is exactly what I love to see! Happy SPRING BREAK! Just a reminder that there will be no God Squad on Wednesday, March 23rd. But, there will be Sunday school this upcoming Sunday, March 20th (no music as Beth is out of town and the nursery is closed). I will be out of town March 19-24th. Our younger Sunday school classes covered Mary Anoints Jesus (John 12:1-8) and our older class discussed suffering and Jesus’ betrayal, arrest and trial this week. 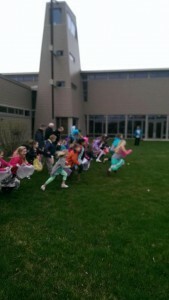 Our God Squad classes covered a combination of Jesus Enters Jerusalem, (Luke 19:28-40 and John 20:1-18). The younger kids made “Happy Easter” cards with Roxann and Liz to send to those in the community and church that need a little pick-me-up. The kids really enjoy this! Their favorite part is adding sprinkles to the letter! 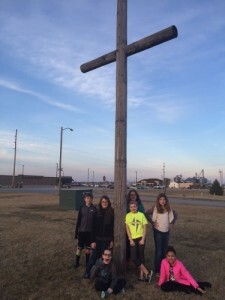 Tom’s class celebrated March Madness in their own spinoff “Bible Madness.” This concludes our Jesus Lives lesson and we will now enter the Believe unit following Spring Break. I promised to update you on the details of our extra activities. I’ve been working to get these scheduled and we are almost there. Below are the dates that you can put on your calendar. More details and sign up will come as soon as everything is finalized! On March 27th in between services, we’ll have two Easter egg hunts set up for the kids (one for the little kids and one for the older). The egg hunts will begin around 8:45, depending on when the kids finish their breakfast. If you have candy to donate there is a box marked “Easter candy” in the kitchen area. The eggs will have a mix of candy, stickers, stamps, temporary tattoos and other trinkets to give the kids a variety. I know all about Easter-candy overload! The April 3rd Sunday school session will take place in the children’s garden with Jim Nelson and Susan Brakhane. Because the kids will plant and perform hands-on gardening activities during this time, please send them in play clothes if possible. The end of the year party for our Sunday school kids will be held on Sunday, April 24th (last day of SS) from 9-10:20 a.m. I’ll have a small breakfast for the kids (most likely donuts and cinnamon rolls), games set up outside and a bounce house! If you wish to help out with the event or donate some of the breakfast items please let me know! The last day of God Squad is Wednesday, April 27th. Following dinner Tom, Roxanne, Liz, Courtney and helpers will walk the kids over to Fareway to shop for the food and PAW pantries with the children’s offering and classroom change they have collected! St. Paul’s first Parents’ Night Out is scheduled for Saturday, May 14th from 5:30-8:30 p.m. Take some time to yourself and bring the kids to church! Courtney, Nate and our youth volunteers will have dinner, snacks, games and various faith-based activities to keep the kids busy! More details, time frame, cost and sign up will be available soon. St. Paul will host three children’s classes during summer break! The first gardening session is scheduled for Sunday, May 22nd with Jim Nelson and Susan Brakhane. A cooking class with Heidi Boyd is scheduled for Sunday, June 5th. Kristy Hoefing will also lead a Kool-Aid and Canvas class (date will be scheduled soon). More details, time frame, cost and sign up will be available soon. As a follow-up to the recent Youth Sunday service, this week’s Sunday school classes covered “The Prodigal Son,” Luke 15: 1-3, 11-32. They discussed the strength of God’s love for us, despite our sins and mistakes. The younger kids loved seeing teacher Camma Stott’s cherished family photos that she brought in to describe her love for her own family. Our God Squad classes discussed Passover and The Last Supper, Luke 22:7-20. The younger group traveled to the busy and noisy Jerusalem and shouted “Hosanna” when Jesus came by on his donkey. 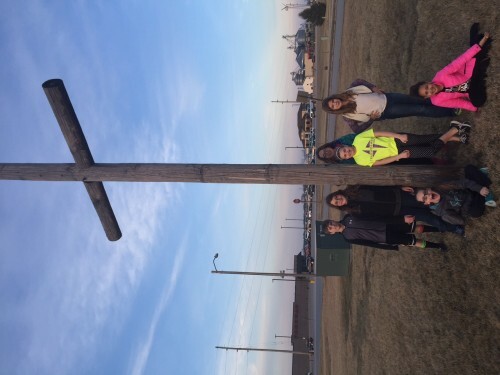 They also created a spring magnet that said “Jesus Gives Us New Life.” The older God Squad class began with a trip outside to take photos of all the items that remind them of their savior. After, they enjoyed grape juice and bread during their own Last Supper. As we head into spring, I have a few important dates and reminders for our St. Paul parents! On March 20th, the nursery will be closed and God Squad will not meet on March 23rd due to Spring Break. We will have Sunday school on March 20th. On March 27th in between services, we’ll have two Easter egg hunts set up for the kids (one for the little kids and one for the older). The egg hunts will begin around 8:45, depending on when the kids finish their breakfast. If you have candy to donate there will be a box marked “Easter candy” in the kitchen area beginning this Sunday. Also, the April 3rd Sunday school session will take place in the children’s garden with Jim Nelson and Susan Brakhane. Because the kids will plant and perform hands-on gardening activities during this time, please send them in play clothes if possible. Thank you for trusting us with your children each week. They make us smile!